Walking into something like Million Dollar Arm you know exactly what you're going to get and so you are likely fine with that because you're choosing to walk into it in the first place. One may see the trailer for it and think it is worth giving a shot because the story seems interesting and heartfelt (plus it's based on a true one, so that's always a bonus) and it was made by Disney, a prominent feature in all the advertising as well as the fact it comes from the producers of Miracle and Invincible, so it is a safe bet there is nothing truly offensive but rather material that is inspiring and wouldn't hurt to take the children to if you feel like going to the movies, but not sitting through an animated flick or one of the several comic book movies out at the moment. 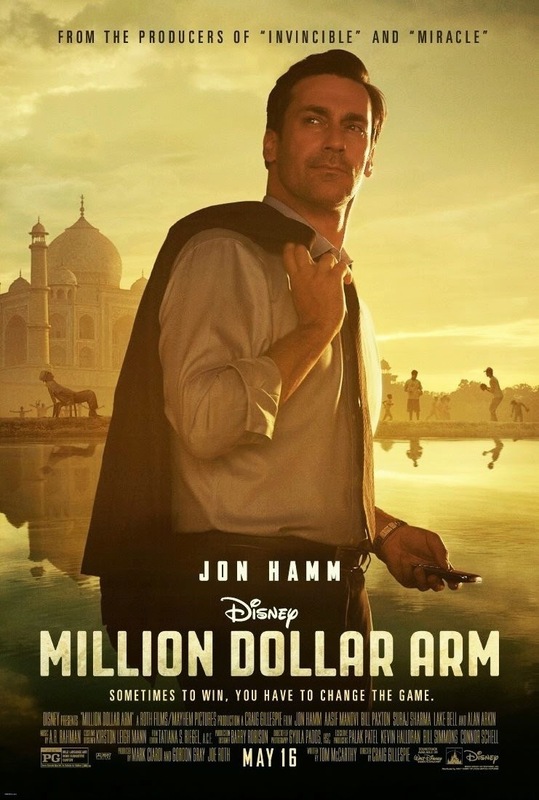 It makes sense, but when it comes down to it that is all Million Dollar Arm ever really feels like, alternative programming. That being said there isn't anything necessarily wrong with the film given the way it has been chosen to be told or how it is executed except for the fact that it is about twenty minutes shorter than those other comic book movies crowding theaters right now yet still feels twice as long, especially in the second hour when we better know the formula of where the movie is going and instead of delving into the highlights and lowlights of those spaces in time, director Craig Gillespie (Fright Night, Lars and the Real Girl) seems forced to make things fit squarely into the archetypes of all the inspirational Disney sports drama that have come before it. Screenwriter Tom McCarthy (a truly talented writer and director) knows how to make a film interesting and fresh while keeping things quirky while at the same time dealing with as universal a topic as sports (please take a look at his 2011 film Win Win) but here it seems he is more a writer for hire that was brought in to get this real-life story down on paper that would appease the board at the Mouse House and create a nice, safe starring vehicle for an almost done with TV Jon Hamm. Again, no offense to be taken anywhere around this project (they even find the time to acknowledge what could be considered slight racism) and there are actually several moments of nice realizations, intimate portraits and interesting facets about the world of baseball, but as a whole the final result leaves us not with a Remember the Titans-like feeling, but something closer to that of The Greatest Game Ever Played; remember that one? That's what I thought. 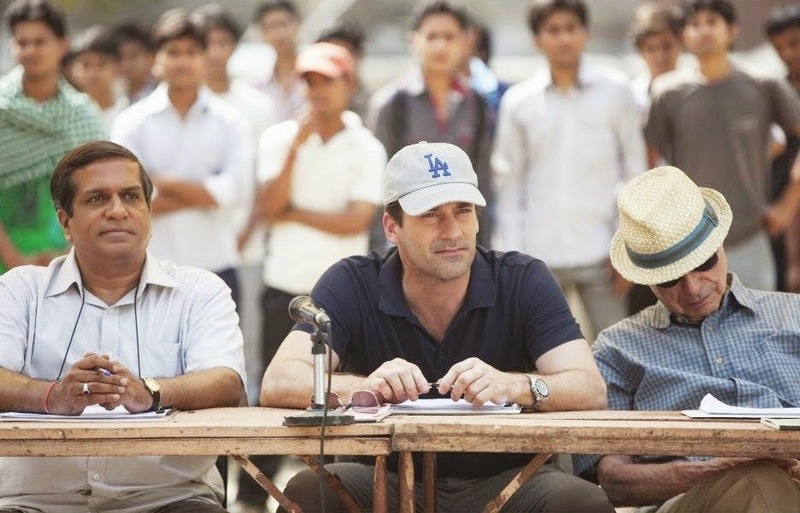 Dinesh (Madhur Mittal), Rinku (Suraj Sharma), J.B. (Jon Hamm) and Amit (Pitobash) in Million Dollar Arm. We are brought into the world of sports agents through the current struggles of one John Bernstein (Hamm) or simply J.B. as he prefers to be called and who is currently looking to make his roster of athletes a little more reliable given that his previous talent (Emmit Smith, Barry Bonds) were all retiring and the well was running dry. He and his partner Aash (Aasif Mandvi) decided to strike out on their own a few years prior and it still isn't going as smoothly as they would have hoped thus the idea was born for the titular contest in which J.B. would travel to India to try and find two players out of over a billion people who could throw a baseball at over 90 miles an hour or over. Watching cricket on TV late one night while channel surfing also caused him to catch the clip of Susan Boyle's triumphant audition on Britain's Got Talent (no word on why Britain's Got Talent was on in Los Angeles or how Susan Boyle was auditioning in 2007 when these events actually took place as her audition didn't happen until early 2009, but who's nitpicking?) J.B. meshes the two thinking of India as the last, great untapped market for American sports. The country is known for its love of cricket, they have to pitch balls at high speeds in the game, would it be so hard to find prospects for major league baseball teams in a country with such a large population, a population he could convert to be fans of the sport and new buyers of MLB merchandise? He certainly hoped not and so after securing enough backing to turn the idea into a reality J.B. along with a curmudgeoned old scout (Alan Arkin), his assistant Vivek (Darshan Jariwala) and his new, free for hire translator Amit (a hilarious Pitobash who has some of the best moments in the film), who's always loved the game of baseball, but never been afforded the chance to play or be a part of the sport in any way, set out to find the first great baseball players from India. Within the first hour of the film we are introduced witness to Rinku (Suraj Sharma from Life of Pi) and Dinesh (Madhur Mittal of Slumdog Millionaire) picking up their first baseballs to being swept off to America to prepare for a major league tryout with innovative USC coach Tom House (Bill Paxton). The premise, in and of itself is engaging and a bit outlandish, but just far enough to the point you want to see if they can pull it off and that is the hook that holds throughout the first hour while not quite delivering in the second. While I said in the first paragraph of my review that "there isn't anything necessarily wrong with the film given the way it has been chosen to be told," those words were chosen very carefully. The filmmakers and writer chose to tell this story from the perspective of Bernstein and in doing that they created a film that was about a man who is consumed by his career and who prides himself on what he does within the realm of his job essentially allowing what he did for a living to define who he was as a man. There is nothing wrong with this approach at all especially given the no doubt countless people who can relate to that sentiment not only in the U.S. but all over the world and in numerous professions. The film uses J.B.'s profession and the unique opportunity afforded him in getting "Million Dollar Arm" off the ground to bring into his life the realization there is more to life than fast cars, loud parties and super models. The film uses Rinku, Dinesh and Amit to show J.B. the importance of having people around you who actually love and support you rather than those who are simply looking to gain something from your connections or abilities. The manner in which they were thrust into his life essentially forces J.B. to re-think not only the way he did things currently, but about the long-term effects of living life the way he had. Whereas before he prided himself on living a single life the way he wanted to with no direction or limits from anyone (something he frowns upon when Aash uses them as excuses), when Rinku, Dinesh and Amit come into the picture and allow an actual relationship to blossom between J.B. and his tenant that lives next door, Brenda (the always welcome Lake Bell), as opposed to one-night stands he begins to see the prospect of a wife and children as something more than detractors of his life and his job, but a family that make him feel as if he's on the right path, a path he owes to these guys who he'd thought of purely as an eventual payoff before. Again, there is nothing wrong with this approach as it features a great character arc and in the role of Bernstein Hamm delivers a fine performance that shows us this guy that is somewhat of a jerk, but with the layers of simply being driven and focused, not just because he's naturally a jackass. There is an admirable quality in approaching the film this way and the real-life Bernstein was no doubt approached with the idea of them making a movie about his life, but there are elements here that suggest the better film might have come out of telling this tale from the perspective of Rinku, Dinesh and Amit. Vivek (Darshan Jariwala), J.B. and Ray (Alan Arkin) scout for baseball talent in India. The American dream has become such a novel idea that it almost no longer seems attainable in the sense it was tossed around with even twenty-five years ago, but in many ways Runku and Dinesh were afforded an opportunity and took advantage of it in a way that delivered them the chance to live their lives in a way they never thought possible essentially earning them the ability to prosper through hard work, the basis of that now almost mythological ethos. It is from this perspective that the more unique, less formulaic film might have been produced. These two teenage boys were plucked from northern India and then rushed into the vastly different American lifestyle where they had to make what were no doubt not so easy adjustments. Nevermind the fact they could hardly speak a word of English, but that they were dumped in the lap of Bernstein who ordered them pizza night after night; a luxury they'd never seen before with no knowledge to the fact they could get food on demand and would now have to take into account a diet. We get a glimpse of the families that Rinku and Dinesh leave behind and that it is with mixed emotions their families let them go, but we never see what the special bond between Rinku and his mother might entail or why Dinesh feels such an obligation to his father and the work he does day in and day out that would easily be surpassed by the money granted from his baseball opportunity. I come at it from this angle because we know where the story of J.B. is going to go and ultimately we know that Rinku and Danish will be signed to pro teams as well, but it is what they do during and how they handle these journeys that makes a movie about the people and events interesting and it seems obvious the experiences and cultural differences in how Rinku and Dinesh might react to such situations and opportunities would be the much less predictable film. There is little to no hope in the lives of these people the film portrays in India and in these pre-determined lives Rinku and Dinesh were given a chance to break the mold, becoming heroes to children all over their country. You'd think that way of thinking alone would have been a good enough pitch from the other side of the tracks to convince Disney it might be more original to go with how the white man enabled hopes and dreams into realities, no matter his original motivators or intentions, rather than how the Indians taught the white man a valuable life lesson. The truth is though, we can all stand to keep learning and so no matter the approach there is no harm, no foul and we get a message perpetuating to think outside the box, something the makers could have stood to do, but instead deliver exactly what we expect.